"You should know this already, that there are two classes of men, devotees and demons. The whole history is that the peaceful devotees are disturbed by the demons but that the devotees are always victorious by the grace of Krsna. In the Bhagavad-gita Krsna ordered Arjuna to declare to the whole world that His devotees would never be vanquished. And in the last verse of the Gita, Sanjaya says wherever there is Krsna and Krsna's pure devotee Arjuna there will always be opulence, victory, extraordinary power and morality -- tatra srir vijayo bhutir dhruva nitir matir mama. But because we are engaged in warfare with the forces of Maya, there will be casualties. Even Arjuna's son, Abhimanyu a 16-year-old boy was killed at the battle of Kuruksetra. We should be prepared to protect the Deities and always expect Krsna's Mercy, because we are always dependent on Him and we cannot do anything on our own without Him. You have asked about whether nuclear devastation on this planet would effect the Sankirtana Movement. No, there is nothing that can stop the Sankirtana Movement because it is the will of God Himself, Lord Caitanya, that His Holy Name be heard in every town and village. Neither can the demons devastate this planet independent of the will of Krsna. Nothing happens without His sanction. If Krsna wants to kill someone no one can save Him, and if Krsna wants to save someone no one can kill him. For our parts we should just be determined to carry out our mission against all opposition, demons, nuclear war, whatever. 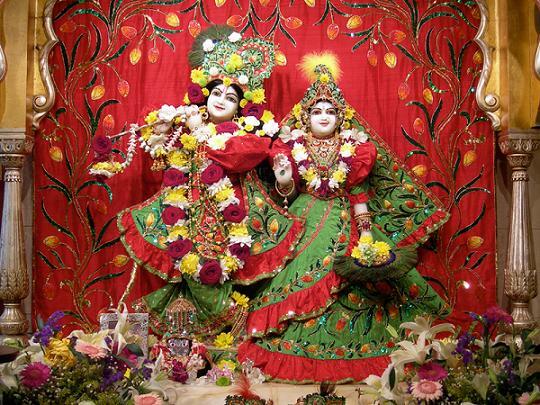 The whole universe is finally subject to certain annihilation by the will of Krsna, but devotional service is eternal and is the only certain way one can save himself from devastation. We can preach all over the world that the only way to be saved from collective and individual devastation is to take to the chanting of Hare Krsna. In short, this material world is a very precarious place therefore we should always chant Hare Krsna and seek Krsna's protection."